A high-profile report prepared to mark the World Pneumonia Day (November 12) by a well-known US-based institute has revealed that, over the last year, there is an increase, albeit marginal, in the number of under-five deaths among children because of pneumonia and diarrhea. Titled “Pneumonia & Diarrhea Progress Report: Reaching Goals Through Action and Innovation”, and prepared and published by the International Vaccine Access Center, at the Johns Hopkins Bloomberg School of Public Health, the 2016 report reveals that have been 296,279 deaths, as against 297,114 deaths mentioned in the 2015 report. 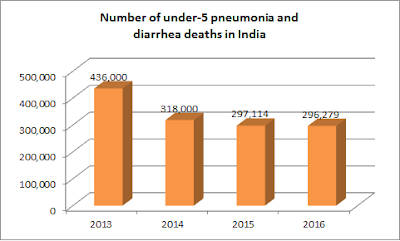 No doubt, the report says, the Global Action Plan for Pneumonia and Diarrhea (GAPPD) scores improved for 12 countries out of 15 countries, with six countries realizing “an improvement of five or greater percentage points (India, Angola, Ethiopia, Indonesia, Niger, and Bangladesh)”, India’s GAPPD score remains poor. 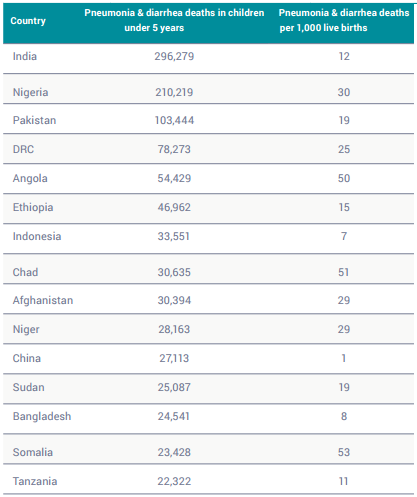 It regrets, “India increased its (GAPPD) score by seven percentage points, although still remains with a score below 50.” India’s GAPPD score, according to the report, is 41%, which is lower than as many as 10 other countries out of 15. 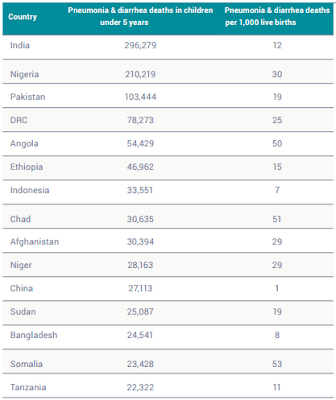 The countries which score better in GAPPD include Pakistan (46%), Afghanistan (51%), and Bangladesh (58%). “It is increasingly evident that without significant gains in GAPPD scores in countries with large birth cohorts, such as India, Nigeria, Pakistan, and Democratic Republic of the Congo (DRC), reduction in global pneumonia and diarrhea mortality in children will not be achieved”, the report underlines. “The pace of progress must be accelerated to make a difference in reducing global totals, which will occur through both the increased use of recommended interventions and treatment innovations”, it adds.